Choose from two carbide tipped 1/2" shank router bits sets (only 2 router bits needed!). Follow along with our detailed Online Instructional Video, and you'll be adding a lovely and elegant touch to your home's walls in no time. 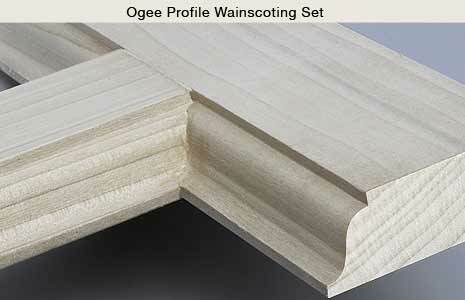 Classic Wainscoting gives any room a dramatic (and practical) Early American or European ambiance. It protects walls and is easier to clean than drywall or plaster).Apply directly over existing walls, or over beaded plywood for a more stylish look. These profiles require only a single router bit to create the framing, as the router bit profile will mirror itself when flipped 180º. Our Pedestal Molding Bit completes the set, creating an attractive cap rail to transition from the wainscoting to the upper wall. Use with 3/4" thick stock. 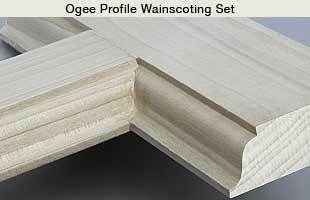 Choose an elegant Classical or distinctive Roman Ogee profile. I used this router bit set to make 8 cabinet doors out of poplar. Two problems: Fuzzy cut and profile not accurately ground to match. All this work was done on a router table with a 3 1/2 HP Milwaukee router. 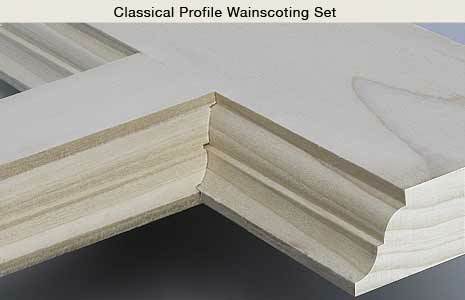 I bought the classical two piece set to use installing wainscoting in a home theater room. I've run over 400 ft of walnut though the bits so far and not even a burn mark. The classical bit setup took about 15 minutes to set to perfection. Once set, don't touch the depth setting on the router. The cuts are clean and match perfectly once set. I'm thinking of building a new router table so I don't have to take this bit out of the old one! If you're a moderate woodworker, you will find this bit challenging, but rewarding when mastered. I'm impressed, but I expected to be from a bit from MLCS. Used it for some wainscotting as well as decorative moulding on a built in. Take the time to set it up and its great for locking in your pieces. Used it with poplar as well as long runs of mdf and it's still cutting cleanly. Two flute carbide 1/2" shank tipped bit with totally enclosed ball bearing guide. 1/4" Radius and 1-1/2" Large Diameter. Two flute 1/2"' shank carbide tipped bit with totally enclosed ball bearing guide. 1/4" Radius and 1-1/2" Large Diameter. Two flute 1/2"' shank carbide tipped bit with totally enclosed ball bearing guide. 1-1/16" Carbide Height and 2" Large Diameter. 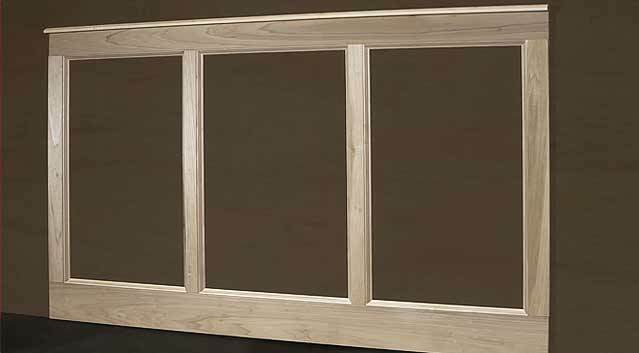 Create beautiful wall trim and paneling for backs of bookcases. 2 piece, 1/2" shank carbide tipped "V" Tongue and Groove set (#8547) features a rounded tapered tongue for easy insertion. This set cuts a 3/16" depth and has tongue thickness of 3/32". The extra long 45º Beading Bit (#8548) allows you to produce a 3/16" bead in boards up to 4" wide. For 3/8" to 5/8" stock. SAVE $14.95! Includes both #8547 wainscoting set and #8548 beadboard bit. Individually $94.90. I added 48 inch high wainscoting to a portion of our living room, using 1/2 inch MDF for the wall and 1” (nominal) poplar boards from a major box store. I used the MLCS Classical router bit for the stiles and rails, and the Pedastal molding bit for the cap board. I consider myself a novice with a router and this project was my first of this size. I found zeroing in the height of the Classical bit to be frustrating, but I eventually got it right so the scrap rail and stile pieces I used for practice would fit flush as intended. (I attribute the frustration more from my inexperience with my new router on a table, than the bit). After that, the project was quite easy. Overall, the wainscoting looks great after sanding pieces before installation, careful painting with latex semigloss white, caulking, and adding some quarter cove trim moulding at the left/right ends to hide the exposed MDF backing. The instructions are not clear on the setup. Adjust the height of the tongue forming bit so that 5/8 materiel is below the bearing. It also needs to be used only with a router fence and table. The fence needs to be flush with the bearing, note that the bearing will never be in contact with the material. Once the tongue forming bit has been use the routed material to adjust the height of the slot forming bit. Typically 5/8 materiel will not make contact with the bearing so again a router fence must be use. 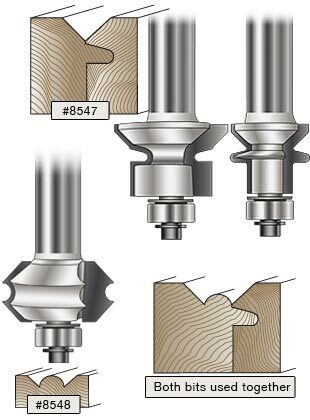 The bead forming bit bearing is a 1/16 too deep to properly form the additional bead so router fence must be used to get the depth of cut correct.